In the constantly-connected world of communication, everyone has an email account. Amongst all email clients, Gmail is the popular application among the users. It is a webmail client that stores all of its data on Google servers. However, day-by-day we get the news of hacking and data loss disaster in Gmail. So, to brace you in advance, SysTools Gmail Backup Tool can be a great help. 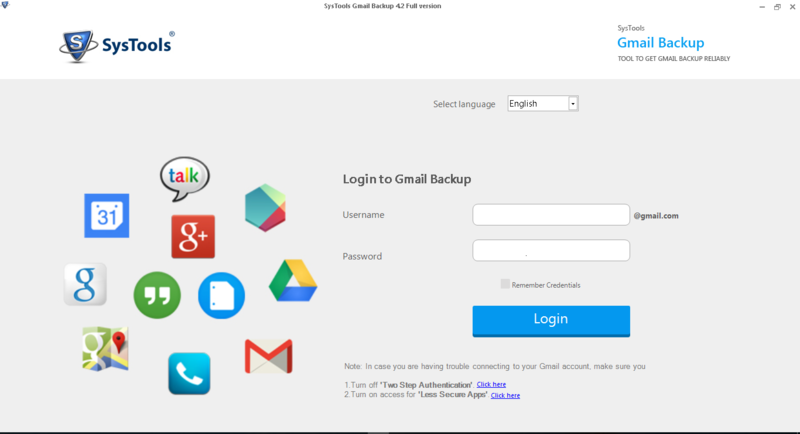 In this review, we are going to show all the features of Gmail backup software along with its working. Let’s get started! It is a commendable program to safeguard Google account data by downloading it on local hard-drive. In fact, the software is blended with superior features which only need to select or check and the rest of the process will be done automatically. The software can be easily downloaded from the official website. Demo version of the tool is available providing all the features with some limitations. 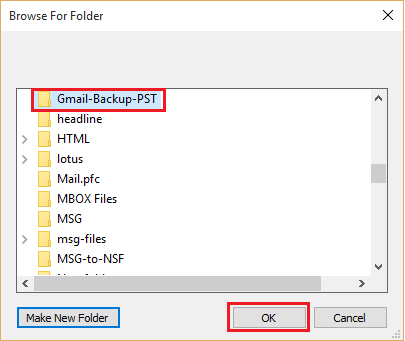 How to Backup Gmail Account on Hard-Drive Via. Gmail Backup Tool? Launch the application and a window will appear with a number of options available. The interface is very straightforward. Actually, the software looks alike Gmail Sign in page. Select the preferred language and enter the credentials and click on Login. Note:- Gmail Backup tool provides multiple options for languages; English, French, Japanese, Portuguese, and Spanish. You can select any of them and log in. Now, the user is redirected to a new page that consists of multiple options. Click on Backup and go to the “Options” section. Here, users will find various features. 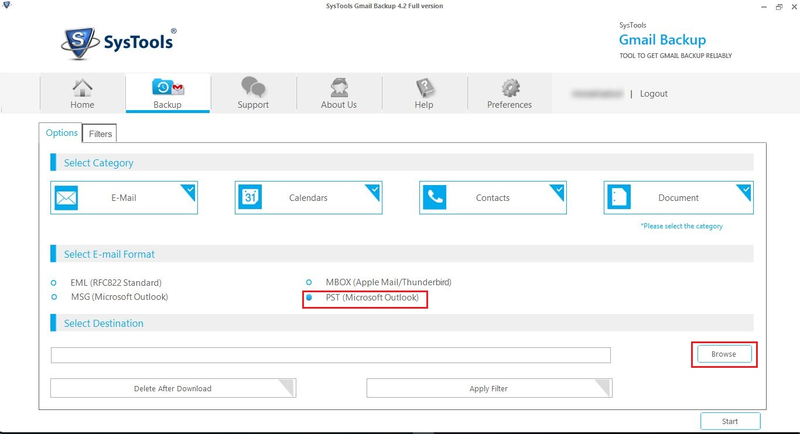 The first option is to choose the category amongst various folders like Emails, Calendars, Contacts, and Documents. This option allows the users to select or deselect data items which are going to back up. After that, conversion formats are available. Users need to pick a format amongst various file formats like: EML, MBOX, MSG, PST. Below, a table is provided that shows which data items get converted in which format. Another interesting option available is “Delete After Download”. With the help of this option, your email can be removed from cloud once they are downloaded to the local hard-disk. As a result, the emails will be deleted from the account and its copy will stay on the computer. It is a helpful feature as it will free-up storage space from your Gmail account making a place for other emails. The Gmail Backup Software also provides an option in which user can manage the internet throttling setting and let the tool utilize the internet as per your instruction. You only need to go to the Preferences tab. Provide the Bandwidth and Unit under the Internet Bandwidth option. After that, provide the time slots and the throttling of internet required percentage for that particular period of time. You can Add different time slots with required internet throttling. Also, users have the power to Delete any time slot from the panel. Next comes Filter tab which is adjacent to Options. This feature does not enable until or unless you check the Apply Filter option. There are two different filters are available in Gmail Backup tool. Once all the settings are done, then you can Start the backup process. You will see the ongoing progress of the download process of Gmail account data with complete status. This is a nice representation to get to know what is actually processing, which folder is being saved, the rate of downloading and items count. Progress Percentage of Current Folder. What Are the Benefits of Gmail Backup Software? The software has some minor flaws during the login time. But, it can be resolved when you ON the less secure apps and OFF 2-step authentication option. Moreover, it cannot be denied that it is a complete backup solution that covers all the data elements of the Gmail email application. It gives a variety of email formats and thus makes the tool a robust product for the users who are using different email clients. Internet speed option is the beneficial feature, especially when you are taking backup of Gmail accounts at the enterprise level. Moreover, Item-level backup, Filters, Delete after Download and other features make the software more desirable. The resultant backup file has complete data of Gmail account in its original layout. Overall, the Gmail backup tool is an impeccable product and can be suggested as a backup solution for Gmail account users. In the end, Gmail backup is the best software to save a copy of cloud-data on a hard-drive in various file formats. It simply offers high-speed, security, reliability, and lots of features that make the Google mail account backup facile. Users will not be disappointed with this tool.